This child's jacket was in the possession of the family of Lord Portsmouth. Traditionally it is said to have belonged to the English king Charles II (1630-1685) when he was a child, but there is no evidence for this. 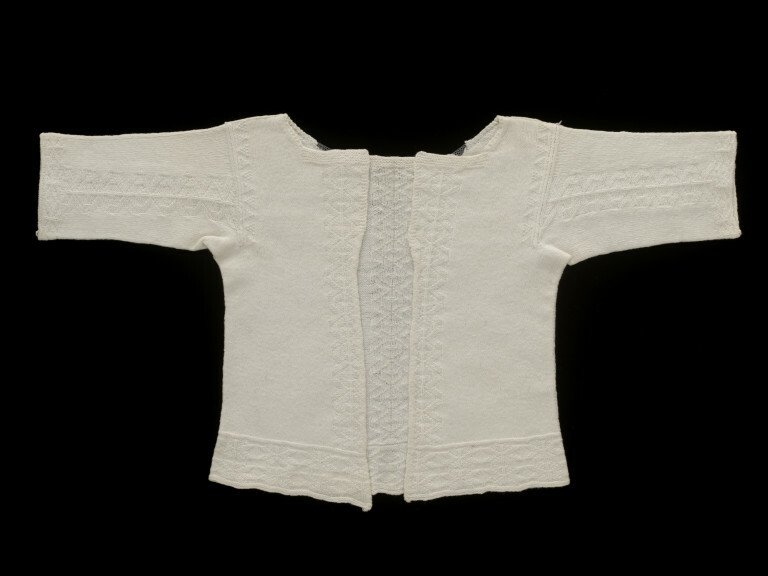 The construction is very similar to adult jackets worn domestically during the same period. 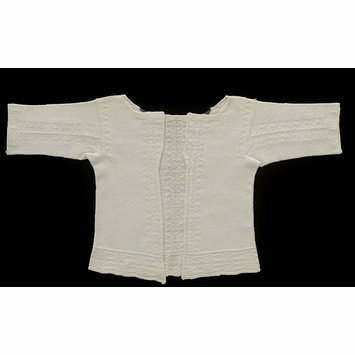 The jacket is knitted in stocking stitch with bands of geometric motifs in plain and purl. The front edges are in garter stitch, rolled over and sewn to keep them flat. False seam lines were knitted into the interior to mimic those found in sewn jackets. In fact, the only seams are along the shoulders, which are joined by casting the front and back stitches off together. 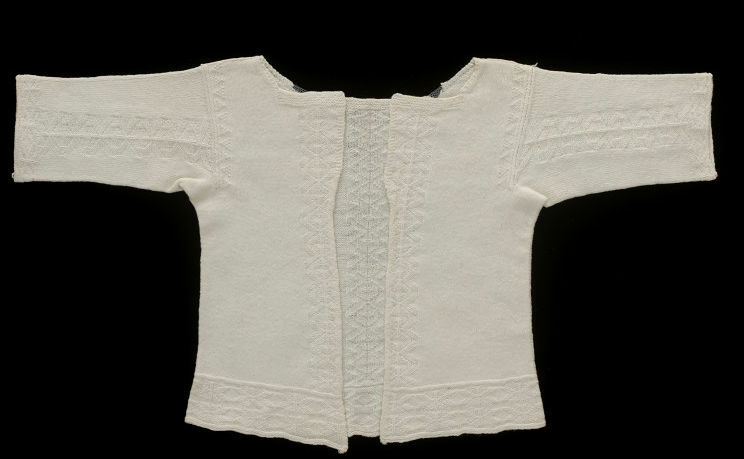 Baby's jacket hand-knitted in stocking stitch from cream-coloured two-ply cotton. It is decorated with bands of geometric motifs in plain and purl. Historical significance: The jacket is said to have belonged to Charles II as a child and was in the possession of the family of Lord Portsmouth. The jacket was knitted in one piece in the round and was then slit down the front and the raw edges hemmed. The shoulders were joined by casting off the front and back stitches together. It is knitted in stocking stitch with bands of geometric patterning in plain and purl, and the false seam lines are knitted in. A number of these beautifully worked jackets have survived, many of them with 17th century associations - this one was said to have belonged to Charles II as a child.